Your kids will look good both on and off the sportfield when you shop here. Enjoy discounted Kids fashion from 0-15 years now up to 50% off big brands including The North Face, Adidas and Nike. Perform well and look good for less when you take advantage of discounts of up to 50% off a selection of men's sports and fashion products including footwear featuring big brands such as Nike, Adidas, Puma, 11 Degrees and much more. Where do I use my JD Sports voucher code? Click to reveal the JD code on the NetVoucherCodes website then click through to JD's website. When you’ve added your items to your shopping trolley click the ‘Checkout’ link at the top of the website. Review your items and paste your JD Sports discount code into the box below the order summary. Click ‘Redeem’ to apply your discount to your total. Click 'Checkout Securely' to complete your order details. JD Sports fuses fashion and sport to create a world of stylish activewear that provides both comfort and style. You can rest assured that all the products on offer at JD are made to aid you in your performance and keep you feeling relaxed, comfy and stylish in your downtime. 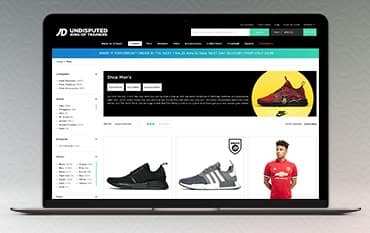 So whether you’re looking for something to wear on the track, in the gym or on the couch you can find exactly what you’re looking for at JD Sports. Pick up the latest pair of Nike Air Max trainers, a brand new Puma tracksuit, the most stylish Ivy Park leotard or anything else from brands like Converse, The North Face, Under Armour, Hype and much more. Shop from numerous categories for everything from tracksuits to school bags to football boots and kit the whole family out with the very best in sportswear. Keep your street style looking fresh with Vans shoes, Puma hoodies and tracksuits from The North Face and never miss out on a bargain again with the discount filled clearance section available on the homepage. Save money at JD Sports using their fantastic clearance section which features tons of discounted clothing and footwear for men, women and kids. As well as the clearance section JD Sports also offer newsletter sign-ups. Once you sign up to JD’s newsletter you will receive regular news, offers and deals, all of which will be delivered straight to your inbox. You can also use Netvouchercodes’ handy JD Sports codes and discounts to save money on your online order. Although it supplies masses of stylish streetwear, JD Sports’ main focus is it sports clothing and activewear. Shop around for gear that’ll keep you performing at your best, all of which is available at affordable prices. Discover track pants and tracksuits as well as training kits, football kits, running and fitness wear, swimwear and sports bras. Shop via activity to find exactly what you’re looking for. Choose from a number of activity categories including running, yoga, football, basketball, tennis, rugby, swimming, spin and cardio. Whatever you need you’re bound to find it, with products available for men, women and children. You can also enjoy mega deals, a clearance section and free delivery on selected orders! JD Sports are known for their vast array of trainers for sports, the gym and everyday wear. JD never fail to get you stepping out with the latest and greatest men’s trainers. From the classic Nike Air Max 95 trainers, to the freshest drops of iconic Adidas NMD trainers - they’ve got your footwear collection sorted. Shop from collections by huge brands like Nike, Adidas Originals, Jordan, Reebok, Vans, New Balance and Converse. Find classic trainers, hi-tops and trainers for specific sports for men, women and children and stay stylish and comfortable for an affordable price. Standard delivery is £3.99 and free over £60. All orders can be returned within 14 days of purchase for free to one of the JD Sports stores, you can exchange your item within 28 days. Find the opening times for your local JD Sports with the store finder. Twitter: Contact the dedicated Twitter Customer Care team using the Twitter handle @jdhelpteam. Live Chat: Available on the desktop website. JD Sports remain the pioneers of the sporting industry, offering quality performance gear, activewear, loungewear and stylish footwear. JD stock a variety of collections and products from top brands including Adidas, Nike, New Balance, Vans, Puma, Ivy Park and more. With a JD Sports discount code, you can shop from a world of goods to support you and your fitness. With so much high-quality clothing and sportswear to choose from you’re guaranteed to stay on trend and stay looking fresh during every workout and sports event. We are constantly on the hunt for first order Discount Codes for JD Sports to help you with your money saving. Our experts check dozens of sites for secret codes including NHS discounts, student sites & social media channels saving you time & money!